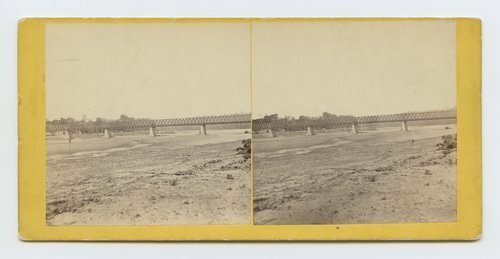 This stereograph shows the turnpike bridge across the Kansas River at Wyandotte, Kansas. It is from Alexander Gardner's series, Across the Continent on the Union Pacific Railway, Eastern Division. Turnpike bridge across the Kanas River, near Wyandotte, Kansas. 287 miles west of St. Louis, MO.